The Azimut 55 features which first impressed us were the imposing shape of the stern and the new lateral fin-shaped windows with external mirrored glass - it is possible to see from inside but not from outside. The Azimut 55 may be classified as a luxury yacht not only because of the size of the flying bridge with its fittings, layout and details - such as the mast aft - but also for the inner salon with its original and innovative solutions, e.g. the access door from the cockpit, with the space-saving convex- shaped shading panels. And there is more. Thanks to a simple rotational movement the dinette table may double its surface. 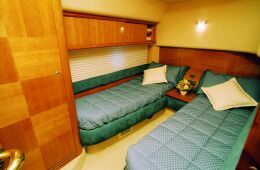 The beautiful open-air galley has an elegant cabinet that may be used as a worktop and whose bottom part may be opened both from the galley as well as from the salon and may be used to store the Azimut tableware. In the salon, there is a large bar cabinet with bottle-holder, color TV set with VCR and ice-maker. The refrigerator on the flying bridge, the one in the cockpit plus the refrigerator/freezer in the galley and the salon icemaker offer an enviable quantity of cool storage space. The helm station is elegant and functional with clever solutions such as the possibility of using part of the forward settee as chart table settee. What strikes the attentive eye are the interiors particulars and the details of the ceilings which become artistic features to be admired. 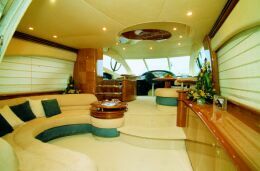 It is quite difficult to describe all aspects of an Azimut yacht, nevertheless one must mention the elegance and the size of the master stateroom which is very comfortable for a 55 footer especially because it occupies the total width of the boat and because thanks to the six lateral oval portholes (three on each side and located above the settee and the dressing table) the natural lighting is permeating. 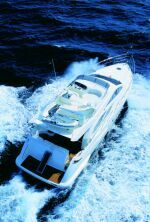 Price with standard equipment and test boat power: Euro 748,862.50 + 20% Vat. 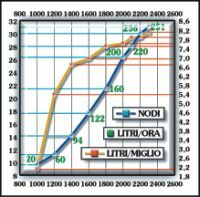 In order to calculate the approximate range in miles with a given number of rpm's, one should divide the fuel tank capacity 581 gallons for the gallon/mile corresponding to that number of rpm's. Consumption values indicated in the graph were submitted by the yard on the basis of the tests carried out on the vessel, but the actual consumption at sea may differ from the published data as a function of the vessel's condition and tuning, of the engines condition and of the characteristics of the propellers used. 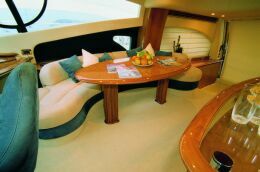 Flying bridge: access from the cockpit by means of a fiberglass and teak ladder, pilot settee for two persons, cabinet with barbecue, sink, refrigerator, 5-person C-shaped settee, sunning area, fiberglass roll-bar, stainless steel rails, manually operated light, waterproof car stereo with waterproof loudspeakers. Helm station with wheel steering, Microcommander electronic lever control, Caterpillar engine instruments, VHF radiotelephone, compass, electronic instruments interfaced with Autohelm ST 60 Multi, ST 6000 Plus (automatic pilot, rudder angle, log, echo-sounder & functions interfaced with Seatalk), sound alarm controls, winch, flap control, anchor chain washing pump. 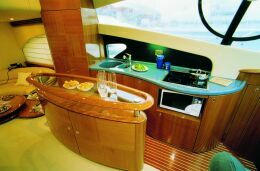 Galley: ceramic hobs, microwave oven, grill, Granulon worktop with two sinks and water mixer, vacuum cleaner, 58-gallon refrigerator, dish-washer, cabinet under worktop and storing cabinet including cutlery, dishes and cooking pots for 8 persons (customized by Azimut for Azimut vessels). 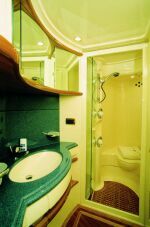 Optional fittings: tender on flying-bridge, water-maker, bow-prop. 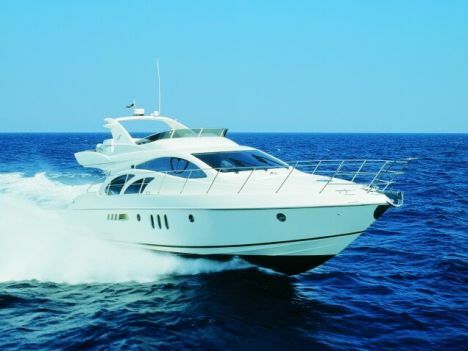 Maximum speed: at 2,300 rpm's (with 1,320 hp) 31 knots. with Bosch battery main switch, two separated battery chargers for different plants, two electric switchboards (one in the waterproof in the engine room and one in the main helm station), high- reliability switches.